Neil Gaiman is one of those authors everyone has heard of, even if you don't read. He's credited as helping to bring comics back to huge popularity. He's also is also considered a successful crossover artist who has brought fantasy literature into the mainstream book markets. He's written many books such as Coraline, Neverwhere, American Gods, The Graveyard Book and Anansi Boys. These books have become so popular that many of them have been made into very successful films. What I really admire about Neil Gaiman is his scope of imagination, it has no limitations, it just goes on and on and gives us these amazing stories that seem out of this world. Stardust is a prime example of this, a highly original yet mish - mash of every fairy tale you have ever heard. This is a tale of a young man undertaking a heroic quest to find his heart's desire. If it were possible for words to dance upon a page it would occur in a Neil Gaiman novel. 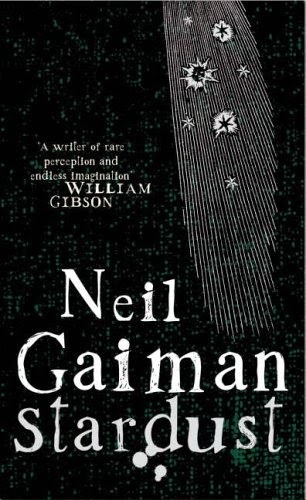 With stardust there is the risk of it coming across as wishy- washy and namby - pamby but as always Neil Gaiman pulls it off making this is tale that not only imaginative and enchanting but realistic and authentic. Stardust also has an edgy quality which is why he has earned legions of fans and sold millions of books worldwide. Stardust is a fairy tale, but it's not for kids. There are many references to well known fairy tales, the types of tales I loved as a child and still do as an adult. However this is one for the adults aka the big kids but still has the charm found in much loved childrens tales. It's so charming that even when a tiny f-bomb, an actual f-bomb is dropped, it is done in a smaller font. One of the joys of reading Stardust is that it seems so real. You get a sense that because Gaiman knows exactly what he is talking about when describing the faerie realm, he might possibly have been there once or twice. Stardust is a richly interwoven tale that uses it's many subplots to add to the tension that builds throughout. Everyone is after the fallen star but not everyone has good intentions and of course each charcter is in conflict with one another, but who will ultimately triumph? The main character Tristan Thorn is instantly likeable and charming in a very British way. Gaiman has a great talent for relating to different characters and perfectly sums up what it is like to be at the strange state in everyone's life where you hover precariously between childhood and adulthood. "He was a gangling creature of potential, a barrel of dynamite waiting for something to light his fuse....."
Gaiman is a master of imagery and prose. Stardust is hugely entertaining and it's funny too. This really shines through in the screen adaptation, eponymously titled Stardust. although as always the book is far superior. It's riveting but also very neat, there are no loose ends and the characters and their actions intertwine beautifully with each other. Every action they make has purpose and consequence that echoes with the natural complexity of real life in a way that isn't confusing for the reader. Unfortunately reading this book has now forced me to buy more of Gaiman's books which I'll devour greedily. Now my "to be read" books pile is now waist high and have ran out of shelf space many moons ago, much to the lament of my other half, another six foot high book shelf is needed!